A sensitive lass, contemplating a feather. She thinks about everything deeply. Nothing escapes her notice. 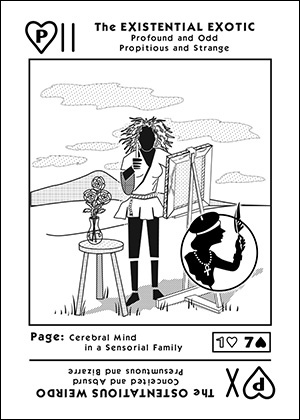 A Cerebral Mind in a Sensorial Family. Existential, because, like the 1 of [X] she is aware. She thinks, therefore she is. Exotic, because, like the 7 of [ / ] reversed she a bit strange. She has a surrealistic imagination. Profound, because, like the 1 of [X] she is propitious and actuating. Contemplative, because, like the 7 of [ / ] reversed she is a speculator, she wonders about stuff.